A solid 4.5 stars. I almost considered a 5 because I was quite impressed with the book, but there were a few minor details that held me back. Either way, this is a definite keeper and one that I will highly recommend.If this one hadn't been a group read for 2 different groups, I probably wouldn't have picked it up because I'm really tired of mediocre angel books. Sure, everyone was saying, "but this one is different, trust me!" Even with that, it's hard to get over being burned.Fallen was one of the most mediocre books that I read in 2010. Hush, Hush was better, but it only got a decent rating because I fell in love with the male lead. 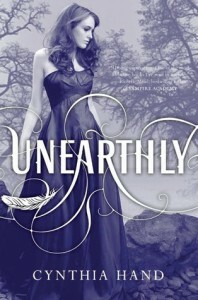 The story itself was okay but nothing special.Unearthly actually had a good story. Huh. Imagine that. Good story and interesting characters. Wait, what? Books are allowed to have both? That's a rarity these days. I even liked the flipping cowboy. How did that happen?